Hunting in a grassy on the grounds of Nairobi National Museum in Kenya. March 2011. 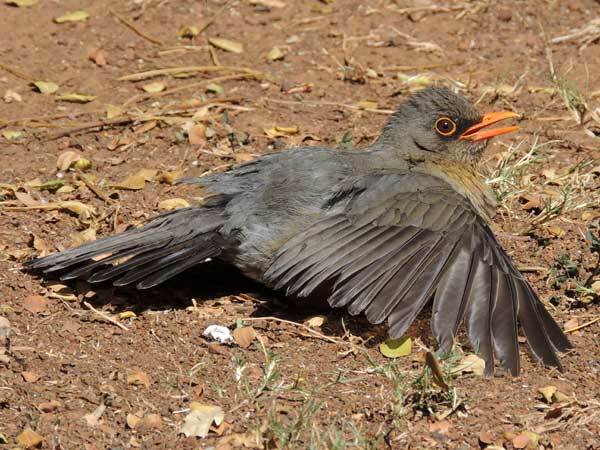 Elevation 1673 m.
In gardens and in lawn areas from mid to high elevations throughout Kenya the Olive Thrush is a frequent and conspicuous bird. The bill is deep orange, the upper chest dark gray, and the belly a tawny orange. 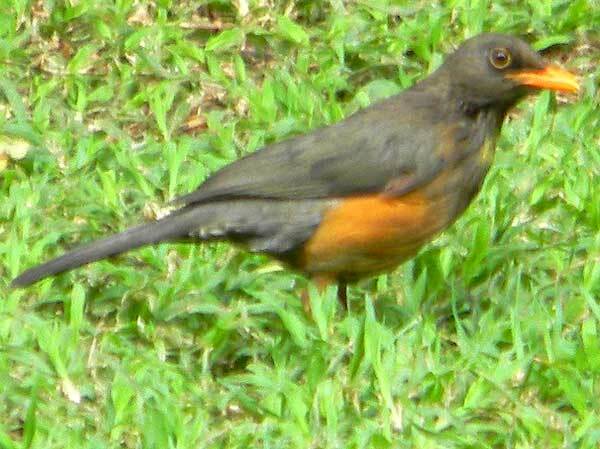 These robin relatives probe into the turf after worms, spiders and other insect life. When available, fruit is also a major part of the diet. This Olive Thrush is exposing its wing and flight feathers to tropical sunshine perhaps to gain some relief from lice. Nairobi National Park, 31 Oct. 2016. Similar behavior has been observed in many other bird species.